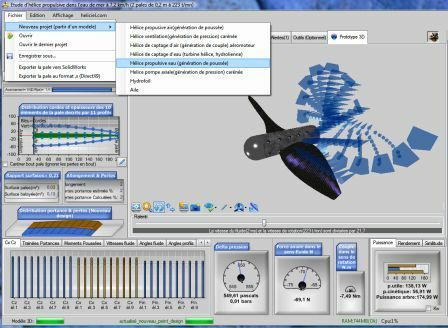 The designer of propellers or wings, HELICIEL software user, do not always have time to go into the theory, but an exact knowledge of formulas and theories used to obtain the results will be useful to engineers wishing to understand, and thus verify the parameters of the project.. . Predictions of performance, such as power, lift and torque, wing or screw propeller is based on mathematical practical tools that you will find assembled here (in part) . Newton and Conservation of momentum reminds us that our actions generate reactions. Blade element momentum theory: BEM for wind turbines and tidal turbines allows us to define the axial and tangential velocities induced distributed along the blade. Dividing the blade elements and introducing performance profiles elements..